The Alien Registration Act (the Smith Act) passed by the US Congress requires aliens to register and be fingerprinted. The Act makes it illegal to advocate the overthrow of the US government. British government recognizes de Gaulle as leader of Ã«Free FrenchÃ­. Channel Islands demilitarized and partially evacuated. The Pope offers to mediate between Britain, Germany and Italy. Following an ultimatum to the Romanian government, the Red Army occupies Bessarabia and the northern part of Bukovina. Marshal Balbo, the Governor-General of Libya is killed when his plane is shot down by another Italian aircraft. 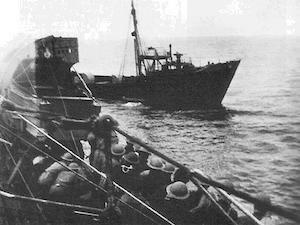 In the Arctic, British light cruiser Nigeria and British destroyers Bedouin, Jupiter, and Tartar capture German weather ship Lauenburg; crew of Tartarcaptures Enigma code books and machine. Vannevar Bush is named as director of the Office of Scientific Research and Development (OSRD), which has just been created by President Roosevelt. Army Group Centre’s Panzer Groups meet to the east of Minsk, capturing the city and trapping 27 Red Army divisions in a pocket to the west. Army Group South meets tougher than expected resistance in its drive through the southern Ukraine. Albania declares war on the Soviet Union. FBI captures eight German agents that have landed by U-boat on Long Island. Low clouds cover the skies over the Ukraine, providing a suitably ominous overture to Operation ‘Blau’, the German summer offensive. Field Marshal Fedor von Bock (“The Preacher of Death”) hurls three armies and 11 Panzer divisions East in a massive assault whose objective is nothing short of the Caucasus mountains and oilfields. In classic blitzkrieg style, the Germans fan out across open steppe and grassland, crushing the 40th Army, folding the 13th Army northward and disintegrating the reeling 21st and 28th Armies. Russian troop command crumbles under the drive. Russian logistics, exhausted by the Moscow counteroffensive, cannot keep up with the demand. A German sergeant tells Propaganda Kompanie men “It’s quite different from last year, it’s more like Poland. The Russians aren’t nearly so thick on the ground. They fire their guns like madmen, but they don’t hurt us!”. That evening, in Sevastopol, German troops cross North Bay under a smoke screen and seize the southern shore, capturing Inkerman in the process. 2 freighters and 1 tanker from convoy PQ-17 suffer accidental damage and are forced to abort. German advance units capture Fuqa and report increasing confusion in the retreating British units. Cologne Cathedral is badly damaged in a raid. The British 2nd Army’s Ã«Operation EpsomÃ­, designed to break through the German defenses near Caen is halted by the fierce resistance of the I and II SS Panzer Korps. The Russians take Mogilev and cross the Berezina river surrounding most of German Ninth Army. The Japanese casualty figures on Luzon are 113,593 killed and U.S. loses are just 3,793.